AviSynth is an advanced, script-based set of tools which help users with the post production of video files. The application does not come with a graphical user interface, so it isn't exactly suitable for novice users but it does provide a very rich set of tools and examples for polishing up video files. Creating and editing scripts can be done using a basic text editor and once completed, save them as AVS files. 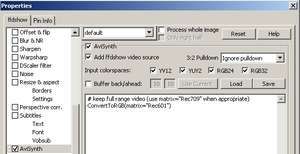 Several mainstream video and media players can open these files. For security reasons, you should also check out the AviSynth download at LO4D.com which includes virus and malware tests. Additional screenshots of this application download may be available, too. AviSynth download been highly rated by our users.